Converse All Star Ombre. - New - Never Worn -. If you are not 100% satisfied. NEW - NEVER WORN. what you see in the pictures is. Type: Chuck Taylor All Star OX. You can already imagine the shift dress and the denim jacket you'll be wearing with these. - Canvas Upper. - Rubber Sole. Color: gold. Style #: 153181F. If the item is used, any and all flaws will be shown in the detailed pictures. These are rare and hard to find in this size. Converse Allstar Sequin Women's Ankle Sneakers Size 11 USA. CONVERSE x MILEY CYRUS CTAS OX LOW WOMENS SILVER SPARKLE 563722c 11 BRAND NEW!!! BRAND NEW, BOX IS NOT INCLUDED..WOMENS SIZE 11 OR A MENS 9..ANOTHER WINNER!!! 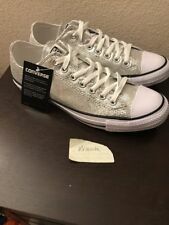 BRAND NEW PAIR OF CONVERSE CHUCK TAYLOR OX - SILVER GLITTER - UNISEX SHOES WOMEN'S SIZE 13- MEN'S SIZE 11 STYLE NUMBER 135851C A GREAT COLOR AND A BRAND NEW PAIR OF SHOES - NEVER WORN! Great shape, well taken care of. Spot on side of shoe as pic shows. Little wear on back and inside also. Converse All Star Tan Brown Hi Top Chuck Taylor. Genuine Leather. Soft lined interior. Make this request BEFORE buying. Smudges on bottom. Nwob Display item Minor display wear. 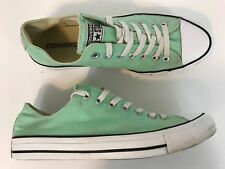 100% Authentic Converse - Brand New With Tags Ships with bottom of original box, original box lid is missing USA Seller Fast Shipping - Shipping M-F - Your order will be shipped out the business day following your order (Holiday's and Weekends excluded). Allow an additional 2-3 days for delivery. Returns Accepted within 30 days for unworn items only. Converse Chuck Taylor All Star Sneakers Feature All-Over Pink Glitter Design, Low Top, & Lace Up Styling. When you are finished, you can check out. 100% authentic! We believe that pictures speak louder than words and do our best to show several photographs of each item, including any flaws we find. 15 photos to view! 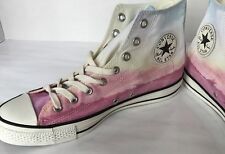 New Converse Missoni Chuck Taylor All Star Oxford Glitter Canvas Purple Pink White Shoe. With box (No Top). Style Code 151256C. All Star Converse low top sneakers in black. Women's size 11. Medium width. Unique style with fleece lining. Cool color highlights the updated style of an iconic sneaker. The first basketball-specific shoe was the Converse All-Star, released in 1917, and Converse has been producing sporty, iconic American sneakers ever since. Wear them with just about anything. Suede leather upper and lining/rubber sole. By Converse; imported. These shoes have been worn once or twice and have no defects. Unique style and neutral color. Front has a few scuffs as evidenced in the photos. Lace Up Closure Condition Excellent condition- minimal worn and well maintained. FAUX FUR ON TOP OF SHOES. I will try my best to work with you.